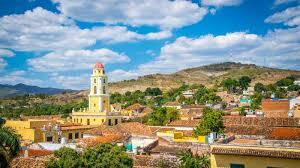 Trinidad is a UNESCO World Heritage City and one of the gems of Cuba. Few places in Cuba offer as many comforts, adventures and cultural richness as Trinidad. Spend your days studying music and dance, with excursions to beautiful water falls, crystal clear seas, snorkeling, eating fresh fish and lobster, and your nights dancing to world class Cuban music. Every day here is filled with music, from 9 am until 3 am you can dance, drum, sing, and learn from some of Cuba’s finest musicians and performers. Trinidad is famous for attracting Afro-Cuban performers from all parts of Cuba because of it’s long history as a tourist attraction, amazing musicians and performers come here to perform. Many of them live in Trinidad, but many come from Ciego de Avilla, Habana, Camaguey, and Santiago to take advantage of the opportunities that Trinidad offers them. In 2012 she lived in Trinidad for 2 months studying the music and dance, and she has continued to visit the village and strengthen her connections here over the past 7 years. Her book, The Breath of Cuba, is offered in Spanish and English and has received a great welcome and response from the Cuban people for the insights she shares on the culture. Cheri has access to everything you need to make your trip to Cuba an incredible experience filled with the true spirit of Cuba beyond the tourist traps. She works closely with DMC Travel in Miami, FL to ensure that all of your travel arrangements are professionally managed and within the guidelines needed for legal travel to Cuba. All Inclusive Package for Trinidad, Cuba available for short or longer term stays. Housing available for individuals or groups from 1 to 12 people can include breakfast and meals upon request. Travel to and from Trinidad to other cities and specialized tours available upon request from Vinales to Santiago de Cuba.